Jamie and Rob have always had a slightly strained relationship. Rob was always Jamie’s big brother, always someone to look up to and do things for, but Rob didn’t treat him well, turning on him for the slightest of things. Now Rob is back from Afghanistan, wounded, he is worse than ever, bottling up his feelings by turning to the bottle he spends his time getting drunk and high. Caro is the mysterious girl who was friends with their sister, Martha, but then suddenly wasn’t. Jamie knows she’s trouble but can’t help but want her. Caro has ideas, she wants to change the world, politics are her thing and Jamie is fascinated with her, but it seems he’s not the only one who can’t say no to her charms. Over the course of one summer everything changes for all three of them. Wow, I was warned before reading this that it’s Celia Rees like she has never seen before and now that I’ve read it, I can see why! I forgot it was her at times and the male points of view seemed so real, were so well written, that I honestly thought it was a guy writing them! The storyline of this book is amazing, you know right from the start that Rob is dead, you don’t find out how or why and these questions stay with you right up until the last ten pages. This gripped me and I just had to keep reading purely to find out exactly what had happened. From the third chapter we are transformed back to the previous summer, the summer that everything changed. We are introduced to the others from Jamie, and we see where his intrigue of Caro starts. I loved the introduction through Jamie’s eyes because it added his thoughts to the two others’ personalities from the start. There is obviously a lot between Rob and Jamie, which we see right from the start too. The story follows Jamie falling in love with Caro, Caro becoming more actively involved with her politics and Rob and Caro becoming closer. I loved how the story progressed but I don’t want to give too much away so I’m not going into too much detail. The characters were amazing; they were so full of depth and so real. I knew people like Caro, loners who just wanted to work alone, sail through life on their own, using people they needed then chucked them to the side when they weren’t needed. Caro wasn’t a likeable character but she was relatable. She wanted more from life and wasn’t going to stop at anything to get it. Jamie wasn’t actually the most well developed character I’ve come across, but I get the feeling that he was made that way to intensify the fact that Caro became his everything that summer, she was all he could think about, other than worrying about his brother and even after Caro obviously breaks his heart he still goes back to her because she is his everything. It got a bit annoying and there were times when I wanted to hit him and tell him to just go for the lovely Lee but nevermind! Then there’s Rob, wow, he’s messed up but I can understand why, he’s just come out of the army, everything he’s known and everything he’s done is now all for nothings because he’s lost his chance in the army. I loved Rob as a character because of how amazingly well developed I found him, he had all the traits of a solider, I’ve read and heard things before of how hard it is to deal with normal life outside of the warzone and this was very well developed in Rob. The three of these were the only characters you really get to know properly in the book but I still liked some of the others from what I saw, I loved Martha, I loved the way she was, she was a proper big sister to Jamie and wanted to look after him in her own way. She’s not the type of person Id usually like but her intentions were good in this book, no matter what! The storyline and the writing is what kept me needing to read on with this book though. The characters were great but no way near enough for me to love it as much as I did. Celia Rees’ writing created brilliant character voices and flowed beautifully. It was the writing which got me to understand what Rob and Jamie were feeling. It was the amazing writing that made me get inside the head of Caro and understand why she did what she did. This is Not Forgiveness is about love, life and dealing with the crap that gets flung at you. It’s about making you stand out for what you believe in and it’s about trust and family. It’s about handling war and the aftermath of it, whether it’s the war that’s raging in Afghanistan or a war between members of your family or friends. I loved the way that this book broached each subject and the ending just had me gobsmacked. I would recommend this story for everyone who ever had to deal with heartbreak, love, and being messed around by family or friends. I also recommend it for schools who want to teach pupils about the aftermath of war and the effect it can have on those involved. 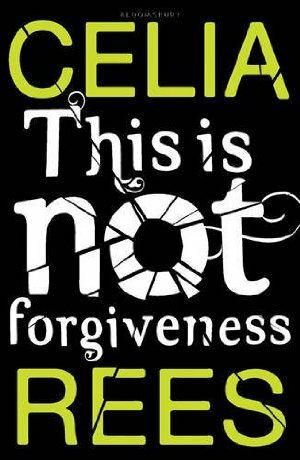 This is Not Forgiveness is the latest from a long list of YA titles by Celia Rees, it is due for release today, published by Bloomsbury Children’s books. Thank you to the publisher for a review copy of this book, this did not affect my views in any way. Great review, I can’t wait to read this one. I didn’t like Cara at all. I thought she had unrealistic ideals and suffered for the consequences. Jamie was my favourite character. Thank you for such a thoughtful, generous and well balanced review. You really did the book justice. Btw – I love dinosaurs, too. I’ve even written a book with dinosaurs in it – have you read The Stone Testament? If not, I’ll send you a copy. Awesome review Raimy, Ive read a bit of this but not finished it yet…wa completely intrigued by the beginning and Caro though! I thought this was really good too. I was thinking about it for ages after I finished. Good review. I have this one but I haven’t got to it yet.